The table is booked! Our May meeting takes place in Liphook, on Wednesday 8th. 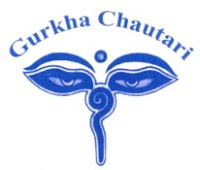 Aperitifs will be at the Links Hotel on Portsmouth Road from about 19:30, and then dinner will be at the Gurkha Chautari, Station Road (about five minutes' walk from the Links) at 20:30. Members are asked please to let us know if they expect to attend by e-mail or through the feedback page on our web site. Looking forward to a great evening and some fine Nepalese food on Wednesday 8th! It was a wet rather than a cold evening, and despite the fact that the meeting was in Petersfield, we had a smaller turnout than usual. There was a variety of reasons for this, including thespian ones. 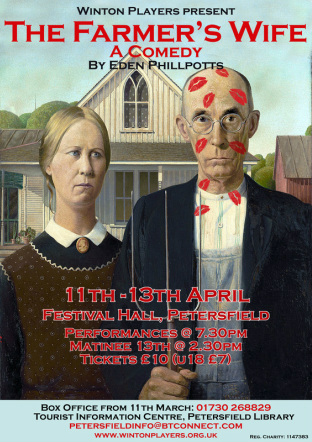 Leading local theatre group, The Winton Players, presents its comedy The Farmer's Wife tonight (11th April) until Saturday 13th, and we hear that at least one of our regulars is involved! After aperitifs at the Old Drum, where we sampled some of its fine selection of real ales, we made our way through the rain down to Dragon Street and a warm welcome. As usual, we asked the restaurant to select the menu with a set price per head for food. The menu that Malabon chose for us was a great combination of good flavours, with plenty of variety - very well judged. After papadums, pickles and a mixed starter, we enjoyed Rajeshwari Chicken Curry (fairly hot dish with tomatoes, garlic and chilli), Gosht Lajawaab (lamb with coriander and cinnamon), Goan Green Chicken Curry, and a King Prawn chef's special. Side dishes included Muj Mela (a mix of five vegetables in a tasty sauce), Bombay Aloo, pilau rice, plain and peshwari naans. Chilli was more evident than garlic, but the underlying tastes of the food came through and we really enjoyed the cooking. One comment was "lovely, very flavourful food", and the fact that very little was left at the end was strong evidence that we all agreed. It all added up to a very convivial evening which we thoroughly enjoyed. Address: Malabon Restaurant, 14 Dragon Street, Petersfield, GU31 4JJ. The table is booked - our next meeting will be at Malabon, Dragon Street, Petersfield on Wednesday 10th April. We visited the Old Drum for a beer before last month's meeting and decided that we'll meet there again this time. They had a very good selection of real ales, and crucially, unlike the Square Brewery, no band running its sound check at the time we were there. So to summarise: aperitifs at the Old Drum about 19:30, and then a few minutes' walk down to Malabon for dinner at 20:30. Of course, anyone that wants to go direct to the restaurant is welcome to do so. Either way, please let me know for numbers, either by replying to the e-mail or through our feedback page. Looking forward to a great evening! Sorry I couldn't produce a report for our March meeting at Paradise Balti. We had a great turnout, a very convivial evening, and my scrawled notes are fairly indecipherable. Just shows I should write up the meeting the morning after.